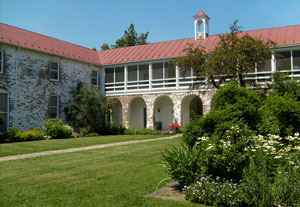 Boyce is in Clarke County in the northern part of the Shenandoah Valley near Winchester. The State Arboretum is located there. What is an arboretum you may ask. According to the dictionary it is "a place where an extensive variety of woody plants are cultivated for scientific, educational, and ornamental purposes." Even if you weren't interested in learning more about trees, you can certainly appreciate the scenic beauty as you stroll along the grounds. You may chose from several walking trails that include a stroll though Dogwood Lane, an old abandoned road that once lead to the mansion over the hill. You may also choose to stroll along the Virginia Native Plant trail or just sit on a bench and admire the quiet beauty of the natural area.